Today’s “Heroes Of The Day” is the fantastic team known as the ALL-STAR SQUADRON! The ALL STAR SQUADRON made their debut in Justice League Of America (Vol. 1) #193 – inside a free preview insert – back in August of 1981. They are Earth-2’s protectors, working out of their base of operations The Trylon and Perisphere (New York City) – The powers and abilities of the team vary, as every World War II American hero and mystery man united in defense of liberty and democracy against the Axis Powers. Notable allies of the team are the Blackhawks;whereas their notable foes are Adolf Hitler, Nazi Germany, Imperial Japan, Baron Blitzkrieg, Ultra-Humanite, Per Degaton, and enemy spies. They’ve been known to be affiliated with the Federal Bureau of Investigation, and the U.S. War Department. When President Franklin Delano Roosevelt received warning of an imminent Japanese attack on Pearl Harbor, he sent out an urgent call to the newly constituted Justice Society of America (JSA). Unfortunately, the JSA had been ambushed by an association of enemies from their own future and were unable to respond. However, with the heroic “big guns” unavailable for duty, a number of other patriots who had recently begun fighting as masked heroes acted upon the President’s desperate pleas. 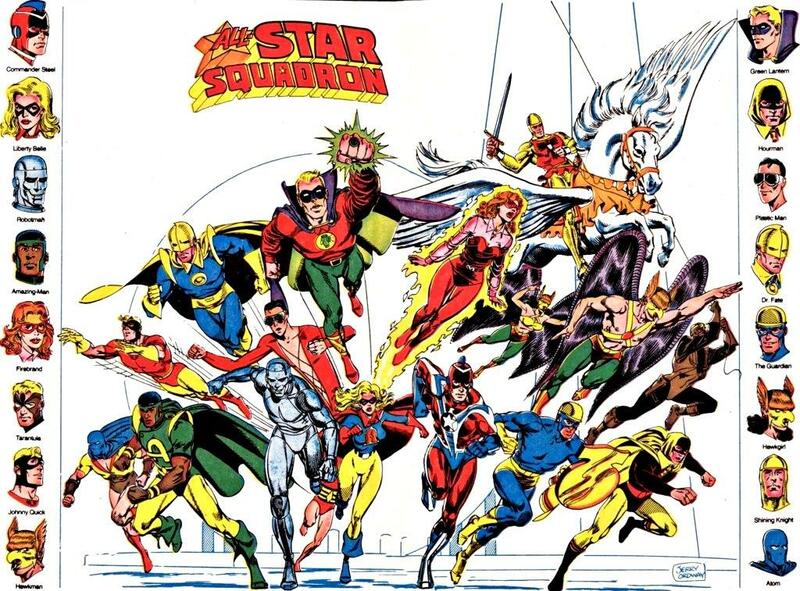 Coming together in the wake of the Japanese attack and led by Liberty Belle and Hawkman, a battalion of theservice new heroes formed the ALL-STAR SQUADRON. This loose umbrella organization comprised the Justice Society, Seven Soldiers of Victory, and Freedom Fighters, as well as various non-aligned “mystery men.” Their joint mission was to defend America until victory was finally achieved. When World War II ended, the All-Star Squadron was duly disbanded. The costumed champions’ overwhelming firepower may well have ended World War II early but for a mystic barrier that covered every inch of Axis-controlled territory. This arcane curtain served to enthrall any magic-based or susceptible hero, turning them into slaves of the aggressor nations. The All-Star Squadron was shaken to its core when the crisis instigated by by the cosmic destroyer The Anti-Monitor reconfigured the multiverse. As a result, history was rewritten and heroes such as Superman, Batman, Wonder Woman, and Green Arrow ceased to exist on Earth-2. This left a leaner, meaner Squadron to battle Hitler’s hordes.